Friday, Feb. 3, 7:30 p.m. | UA’s ENR2 Rm N120, 1064 E. Lowell St.
“A generation has grown up feeling that “it would rather text than talk,” along with believing that it is possible to share our attention during almost everything we do. What are the costs of a “flight from conversation” in personal life, among one’s family and friends? What are the costs in the work world? And, most importantly, what can we do about it? 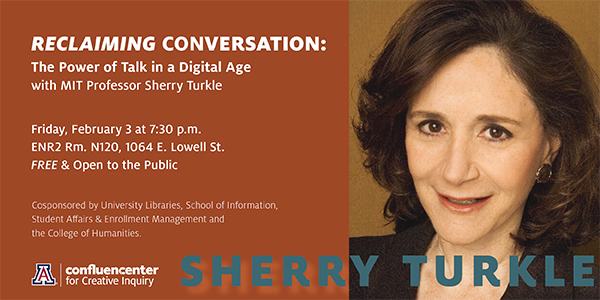 Professor, author, consultant and researcher Sherry Turkle has spent the last 30 years studying the psychology of people’s relationships with technology. 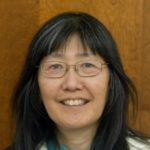 She is the Abby Rockefeller Mauze Professor of the Social Studies of Science and Technology in the Program in Science, Technology and Society at MIT, as well as the founder and current director of the MIT Initiative on Technology and Self. Referred to by many as the “Margaret Mead of digital culture,” Professor Turkle has investigated the intersection of digital technology and human relationships from the early days of personal computers to our current world of robotics, artificial intelligence, social networking and mobile connectivity. Her New York Times best-seller, “Reclaiming Conversation™: The Power of Talk in the Digital Age” (Penguin Press, October 2015), focuses on the importance of conversation in digital cultures, including business and the professions. Copies of “Reclaiming Conversation™: The Power of Talk in the Digital Age” will be available for purchase before and after the lecture and she will sign books following the lecture. "Reclaiming Converstion: The Power of Talk in the Digital Age"
Full room of students/faculty/others to hear this talk about reclaiming conversation. Turkle said that people who are always connected to their electronic machines are “intolerant for solitude”, have to communicate their feelings by “sharing” online, would rather “text than talk”. Face to face communication leads to empathy, intimacy, deep communication, collaboration — all missing now in 21st century. 89% of people took out smart phones while talking with others. She quoted a recent study that showed that overall there is 40% decline in empathy in people now. She also informed us of an experiment in which people were paid $ to sit 15 minutes in a room w/o a book of phone. Most people ended up using electroshock machine on themselves after 6 minutes. (Not clear where/how this experiment happened). Question came up about whether there is any place on UA campus w/o WIFI ,or a “safe place” for people to go & be themselves. Turkle said that people only seem to talk with those they agree with. Book signing followed her presentation. Question asked: does “together again” happen anymore?